The Townstreet concept has been specifically developed to provide the average ’00’ modeller with realistic buildings every bit as good as the best scratch built structures seen at exhibitions and in the magazines. 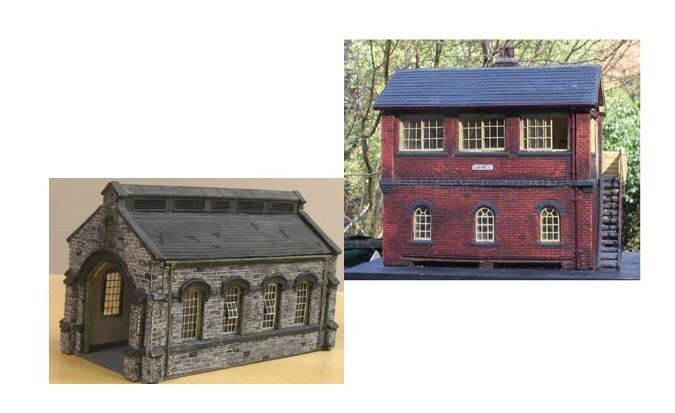 Using Townstreet castings you can match the standard of lineside buildings to the quality track, engines and rolling stock on your layout and you don’t need to be an expert to do it. The ‘concept’ takes into account that for most of us much more has to be achieved in life than the creation of some buildings on the layout and is designed to save considerable time over other methods of construction while still providing the highest standard of realism. This is achieved by using large cast sections which feature fully detailed stone and brickwork with all details like doors, windows, gutters, drainpipes and coping stones moulded in so there is no need to handle small fiddly components. Each section is accurately cast by hand, using a very hard re-constituted stone powder which reproduces the natural texture of stone or brick far better than card, plastic or resin and is easier to colour realistically than these materials. Full instructions are provided but to explain simplyE The porous material will absorb a thin colour wash (thinned down Humbrol mat enamel) and when this is dry a thin grey water paint soaked into the crevices provides realistic cement ‘pointing’ and a degree of weathering. Most assemblies are childishly simple using P.V.A adhesive (or EVO-STIK wood adhesive) with for example the brick station (B.S.20) only having 12 components which should paint in a couple of evenings and go together in an hour or so. The range has been favourably reviewed in all the main magazines and is used by many club and exhibition layouts. Whether you are an experienced modeller or tackling your first layout or diorama you can be confident that townstreet products will provide the desired realism. All townstreet products are hand made to a high standard yet avoid machine precision. Unlike other kits they are designed to have as few pieces as possible saving hours in assembly. Their stone-cast material is considered the best medium to reproduce stone and brickwork and gives crisp castings. Painting is easy, enjoyable and extremely rewarding and anyone can get good results following the simple method in the instructions. While the new resin cast models coming on the market are a great improvement on what was available in model shops before there is still a great risk that any collection of factory made products laid out on your baseboard could look artificial or even toylike. Townstreet gets round this by allowing you to colour your buildings in a more lifelike manner, not only to look more real but to match each other and capture the look of a particular region. Try it for yourself and discover just how realistic you can get buildings to look. Townstreet castings are not available in Model Shops as their specialised nature makes them more suited to direct mail order supply. This means you contact us directly by letter, phone or at the several exhibitions we attend. I have built several Townstreet model building kits and found them very enjoyable. The painting is crucial to a realistic finish and you can tailor them to suit your own region to a certain extent by the colours and tones used. The effects of mortar on brick/stone can be convincingly captured fairly easily, although practice is advised. Townstreet provided several scrap pieces for me to try and their guidance notes are very helpful. The only building I had problems with was the large stone loco shed which involved a lot of filing and fiddling of the roof sections to get it to fit.